A patent for an invention, design or plant in the United States is the grant of a property right to the inventor or designer issued by the United States Patent and Trademark Office (USPTO). It is the exclusive right for a limited time period to make, use or sell the invention in the United States; it also prohibits others from importing the invention into the United States. 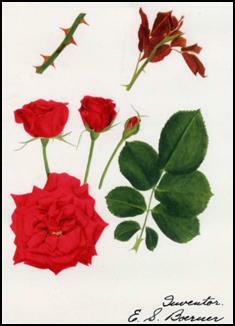 Images of a rose plant patented by Eugene S. Boerner on January 30, 1962 (patent #PP2128). Information about United States patents and answers to many questions about them can be found on the USPTO's General Information Concerning Patents , Frequently Asked Questions and Inventor Resources web pages. The New York State Library has been a United States Patent and Trademark Resource Center since 1871. The New York State Library's collection includes nearly everything the USPTO has published and distributed, ranging from early material in paper, through microforms, CD/DVDs and up to their current online databases. The collection also includes many commercially published resources. You can use the patent collection for both patentability searches and historical inquiries. Most of the U.S. patent collection is housed on the 7th Floor of the New York State Library. The public is welcome to visit the Library and use the U.S. Patent collection. The State Library has trained staff who will assist you in learning to use these tools. Appointments are not required to use the collection but are recommended if you would like assistance. You can make an appointment by calling 518-474-5355 or by sending an e-mail message. State Library staff are not, however, patent attorneys or registered agents, and can not provide legal advice, interpret your search results or strategies, or provide opinions on the viability of a patent application. A directory of attorneys and agents registered to practice before the USPTO can be found on the USPTO Web site.